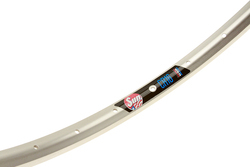 SUN CR16 MTB / Wheelchair Rims - 24"
The SUN CR16 features strong, double-walled construction, making it virtually indestructible. Originally designed for the rigors of MTB use, this rim contains four pre-drilled holes to attach hand rails, for use on wheelchairs. Still works on bikes, too, if you're looking for a vintage rim for an old school 24" mountain ride. Listing is for 2 rims! Save more than 25%!